A tram moved slowly and quietly along Princes Street for the first time in more than 50 years. 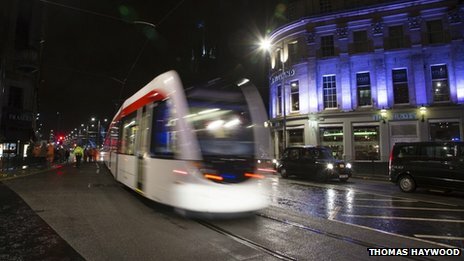 One of Edinburgh's new trams has completed the first test run along the city's most famous shopping street. Tram 264 made the journey on Princes Street late one night during last week, flanked by teams of engineers. It travelled from the tram depot at Gogar on Edinburgh's western outskirts to York Place in the city's east end. The tram crew and engineers completed the necessary track tests ahead of schedule, returning to the depot in the early hours of the morning. It was the first time since 1956 that a tram has run on Princes Street. Council bosses said it was another indication that they were back in control of the troubled project. But with a successful test run completed, it seems the tram project's bosses may finally have put their nightmares behind them. Edinburgh's transport convener, Councillor Lesley Hinds, told BBC Scotland: "We have completed a really significant step forward this evening by bringing the tram onto Princes Street and then onto York Place. "We have really taken this project by the scruff of the neck over the last year and a half. We have all worked together, whether it be councillors, Transport Scotland, council officials or contractors, to make sure this project gets back on its revised timetable and its revised budget." The tram line is due to begin carrying paying passengers by spring next year. An exhaustive testing programme has to be completed before then. Tom Norris, the General Manager of Edinburgh Trams, said: "It is the start of a long process of testing in the city. Tonight is all about checking that the infrastructure is how it should be. "Things are going well at this stage, so it's also a good opportunity for our drivers to experience driving in the city centre for the first time." Diehard tram enthusiasts braved the wind and rain to see Tram 264 make a little piece of Edinburgh transport history. They were joined by passers-by who left pubs and fast food restaurants to watch as the 45m long tram moved slowly, and almost silently, along Princes Street. Smart phones were held aloft and pictures of the tram passing Edinburgh Castle were soon being shared on social media. The tram was flanked by an honour guard of engineers in orange hi-vis jackets, who checked the rails and the distance between the vehicle and the platform edge at the new tram stops. There will be more "ghost runs" in the weeks ahead, which will see near empty trams travelling the city streets in the dead of night. It has been a long time coming. A few years ago a mock-up of a tramcar was exhibited outside the Ocean Terminal building in Leith, a proposed eastern terminus for the tramway. The line currently laid terminates a mile or so short of this intended point. With the project taking so long to complete and especially the long-term disruption caused along the length of Princes Street, the new tram trackbed began to deteriorate and had to have more attention paid in order to bring it up to the required standard, even before the first tram ran. And finally (with tongue firmly in cheek) did Lothian Bus consider their own form of replacement type of alternative transport for Princes Street, by attaching several buses together? From one city preparing to re-introduce trams, to another that has had new trams for a while. 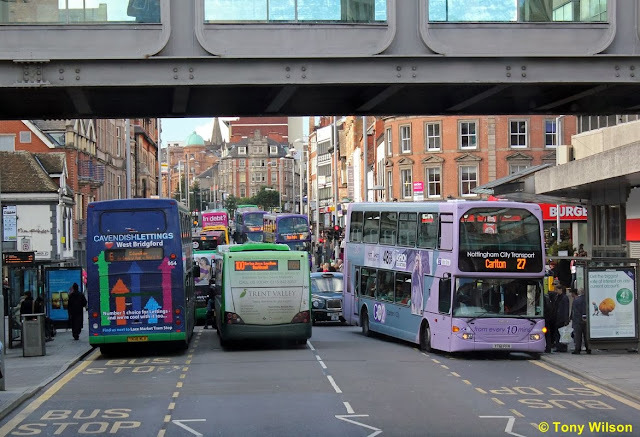 But it is Nottingham City Transport's bus network that is the focus for attention, and just why the bus has a dominant position in the city.